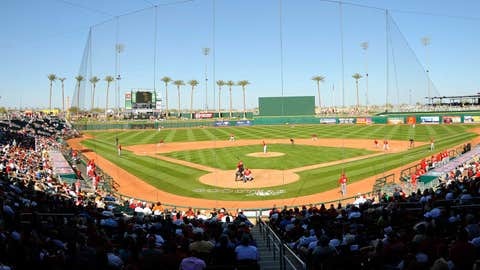 The Reds play their first 2014 Spring Training game at Goodyear Ballpark on February 26 against the Cleveland Indians. The Reds have signed to minor league contracts and invited to 2014 Major League spring training camp pitchers Jose Diaz, Lee Hyde and Chien-Ming Wang; catchers Corky Miller, Rossmel Perez and Max Ramirez; infielders Argenis Diaz, Reynaldo Navarro and Kristopher Negron; and outfielder Jason Bourgeois. Pitchers and catchers are scheduled to report to the spring training complex in Goodyear on February 14. After physical examinations, pitchers and catchers will work out that afternoon. Position players report February 19. After physical examinations, the full squad will work out that afternoon.